A while back this one lady was such a Lord of the Rings fan that she travelled all the way to New Zealand. She visited places like Hobbiton. She then bought a golden replica of the One Ring with only one mission; Destroying it. Being not fit enough to climb Mount Doom, destroy the ring and save Middle Earth (like Frodo and Sam did before her) she went to Wellington, booked a helicopter flight to Mount Nguaruhoe, which is seen in the trilogy as Mount Doom, and once above the massive volcano she dropped the ring in the crater and with that saving Middle Earth once more from the evil powers of Sauron. Call that dedication! What stuck with me, though, was that there is a ring of pure gold, worth a few thousand dollars, somewhere on top of that mountain! This just became a treasure hunt! Mount Ngauruhoe (or also Mount Doom) is part of the Tongariro National Park and sits in between two other huge volcano’s; Ruapehu and Tongario. Together they form the one of the most active volcanoes on the southern hemisphere. The last eruption was a little over a year ago. 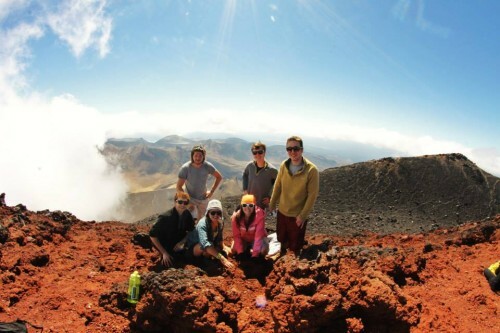 It is also part of New Zealand’s most popular one day hike; the Tongariro Alpine Crossing. My buddy Hans and me did the crossing not so long ago, read all about it here, just days after the track was reopened after its last eruption. It was a massive challenge for our untrained, fast-food fed, bodies and it took us a respectable 6 hours to complete it. 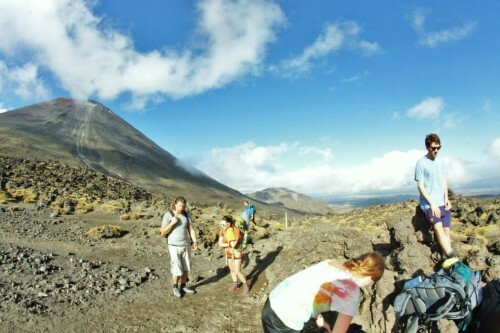 At the time we decided not to push our luck by also ascending Mount Doom but it also left me a bit restless ever since. I felt like the volcano was alpha maling me ever since. Looking down on me. Each time I passed the national park it was like he was laughing at me, like a high school bully. So I decided to return one day and bring that sucker down on its knees. Show him who’s boss! That day was today! And… I wasn’t really feeling it. I had done this crazy mountain bike trail yesterday and my body was hurting. On top of that I tried to save some money by sleeping in my car. Not the best combination to prepare for my biggest physical challenge yet. The best way to climb Nguaruhoe is to start from the south crater plateau. From there the ascent is the least steep. To get to the plateau you walk the first part of the Tongariro Alpine Crossing. Its a good 2 hours walk from the Mangetapopo parking and includes the infamous Devils Staircase. 45 minutes of intense climbing. I created this graphic to illustrate the journey. 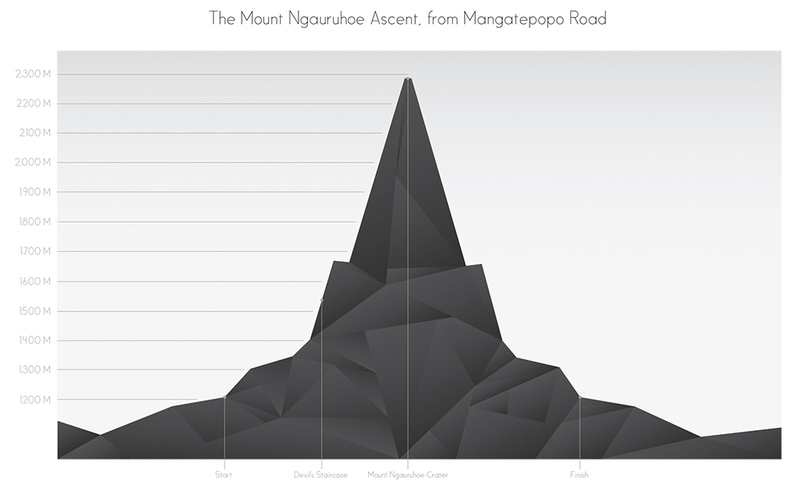 From the start of the Mangetapopo parking you almost ascend over 1000 meters to reach the summit of Mount Doom / Mount Ngauruhoe. The Devils Staircase reminded me once more what I had started. This was only the beginning and it was really getting to me.The funny thing is that every time you stop to catch your breath you get passed by other hikers, but once you start walking again you end up passing them a few meters down the track. This is how I got to talk to two girls. I had passed them a few times but my breaks were becoming longer and longer. The next time they stopped to check in and to talk to me. I learned that the kiwi girl Rosy was showing a group of exchange students around. Taylor was a Canadian girl who joined the group last minute and didn’t knew what to expect. She found out she was in over her head as they were doing the 3-day version of the crossing. We climbed the last part to the plateau together. Once we reached the plateau I met another part of the group. Three fun 20-something year old American guys; Drew, Pete and Andy. We rehydrated ourselves and the guys hid their backpacks behind a rock before we continued up. Until now we had followed a clear defined path but that was about to change. There was no path up, you had to find it yourself. I would quickly find out why. The climb was so steep, and the surface so unstable, that no path would ever survive. At some points you would risk falling over if you stood up. And with every 3 steps up, you would slide 2 steps down. Progress was slow. The only real danger, though, was the risk of getting hit by a falling rock. We were not alone on climbing the summit, and it often happened that one of the many loose rocks starting rolling down the mountain. If it didn’t stop it would become a serious danger for everybody in its way. Several times we were warned and had to warn others about falling rocks. It would be this message passed from the top down by a connection of people. It is really awesome to see all the strangers become one group because of the common goal. We received and shared tips about which way to go. We would cheer for each other once we reached the top, and we would make each other look good on the photo’s we took for them. We were all in this together. Reaching the top was amazing. I was really rewarding, and the view was absolutely stunning. I wouldn’t say it was easy, it was actually really hard and tiring, but by sticking to my own pace it wasn’t as hard as I thought it would be. I wasn’t as fast as the other guys in my group but luckily I had an equal in Taylor and we would stick together and look out for each other. We spend about 30 minutes at the top before clouds started to move in and it was getting to cold. We had a quick snack, cheered for other people and took some photo’s. The way down sounds a lot easier. And it is definitely physically less challenging, but the lack of a proper track and the extremely sharp and loose volcanic rock came with its own challenges. Near the summit we sometimes had to sit and slide down to avoid slipping and rolling all the way down. It only took one innocent slip to create some really nasty cuts on my leg because the rocks were so sharp. But once we passed the first 100 meters we could pretty much slide down in the loose sand. My feet would disappear with every step I took, filling my shoes up with sand, but once you get a hold of it you can pretty much surf your way down. If it wasn’t for twisting my ankle the last part was the funnest part of the whole trip. Back at the plateau we would meet even more exchange students from their group and we all had a long relaxing lunch before I had to say goodbye. I was about to walk to same way back and they were about to walk to into another direction. Maybe you didn’t find the ring, but you f*cking alpha maled (is that even a word?) the hell out of that mountain! Great story to read, well told. Keep them coming.